The World Wide Web Consortium (W3C) is in the process of developing HTML 5, an open standard that could eliminate the need for browser plugins such as Adobe’s Flash video player. One of the most significant of these issues is the use of video on the Web. If you want to include video on your Web page, HTML 4.01 provides no standardized way to do so. To display video, we’re dependant upon plugin applications, such as the Adobe Flash plugin (which plays .FLV formatted video), Windows Media Player (which plays .WMV formatted video), and Apple QuickTime (which plays .MOV and .MP4 formatted video). In the end, this has created a difficult choice for Web designers. Using .FLV is generally considered the safest option, since the Flash plugin is so widely distributed (thanks to its use on sites such as YouTube and MySpace). Using MP4 is often considered the highest quality option, but that extra quality becomes irrelevant if your end user doesn’t have a browser plugin which can play MP4 video. As happens so often in Web design, we frequently compromise with a “lowest common denominator” solution: We use Flash. Even if your video has to take a quality hit, at least everyone will be able to play the video. HTML 5 proposes a unique solution to the video issue: include a video compression codec as part of the HTML standard. The codec will then be built into all new browsers. As a result, all browsers on all operating systems would be able to play video encoded using a single high quality codec. Video plugins would no longer be required, and proprietary formats delivering questionable quality (yes, I’m talking about Flash) would become a thing of the past. It would be a huge victory, not only for fans of high quality video, but for those of us who are also fans of open source and open standard development. As you might have guessed, there is a stumbling block to be overcome: which codec should become the standard? Apple, Google, Microsoft, Mozilla, and Opera all have representatives participating in the HTML 5 discussions. The Register reports that Google, Mozilla, and Opera support using the Ogg Theora codec, while Apple supports using the H.264 codec, and Microsoft remains unusually quiet on the issue (perhaps because a standard codec could render their Silverlight plugin irrelevant). Alternatively, The Register suggests that Google could open source their recently acquired On2 codecs, thus providing a resolution, and playing the role of open source hero at the same time. 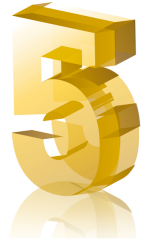 HTML 5 is not something that we’ll be able to fully take advantage of in the near future. Of course, a part of the problem is debate among the companies that must accept the standard in order for it to work. But another major issue is that HTML 5 is not just HTML 4.01 plus video. HTML 5 is expected to include support for new and open source audio, 2D drawing, 3D animation, and even application building. The complexities of HTML 5 have its implementation a long way off: a final standard isn’t expected until 2012. But you won’t have to wait that long to start experimenting with HTML 5 technologies. Apple has already begun implementing some proposed HTML 5 features in the Safari 4 Web browser (link requires Safari 4). 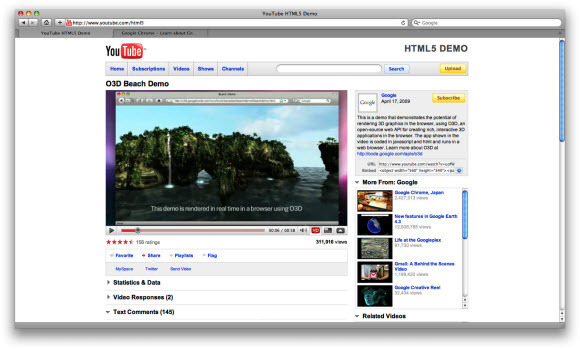 Google has a YouTube page demonstrating HTML 5 features, including 3D animation (link requires Google Chrome or Safari 4). Also, Google’s AppSpot has an HTML 5 Adventures page which includes demos which work in Chrome, Firefox, Opera, and Safari, plus the Android 1.1+ and iPhone 3.x mobile devices. Above: Google’s HTML 5 YouTube page. If you’re a fan of Adobe, don’t feel too bad about their potential loss of Flash revenue. Just as Adobe markets Dreamweaver for HTML development, they will surely market an updated version of Dreamweaver for HTML 5 development, plus new tools aimed at designing for the HTML 5 drawing and animation features. The good news for all of us is that Adobe will have competition from both the corporate and open source communities, making HTML 5 design a much more level playing field than that of Flash design. Hey Anthony, of course ultimately you’re article is on the right track, but your comments about Flash video are very poorly researched. Flash Player has supported MP4 H.264 video since 2007! That’s TWO whole years ago. Did you even stop to think how youtube/vimeo/etc supports HD video via Flash Player? So comments like “we frequently compromise with a “lowest common denominator” solution: We use Flash.” just make me laugh. Think you need a re-write. Vivek: Thank you very much. Philip: I feel that Flash as a “lowest common denominator” solution is right on the money. If a website only allows FLV (Flash) video, it doesn’t matter what you upload, it’s still getting converted to FLV before playing in the Flash player.